I’ve got to admit. I’m all over this color scheme. It might be a bit much for some..and I can only imagine what my teeth would look like after I chowed down on this bad boy..but it’s kind of amazing. 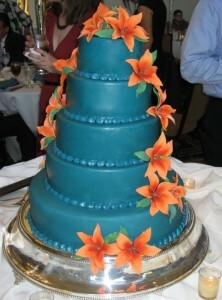 This is a five tier round cake covered in a deep teal fondant and covered in lillies. The twenty-four lilies are actually made from gum paste. That shocked Christen because I thought it they were real flowers–absolutely flawless! There is also a teal piping around the base of each tier. So what do you think of the color scheme? Is the teal too much for you? Or, do you kind of love it like I do? I love your cake! 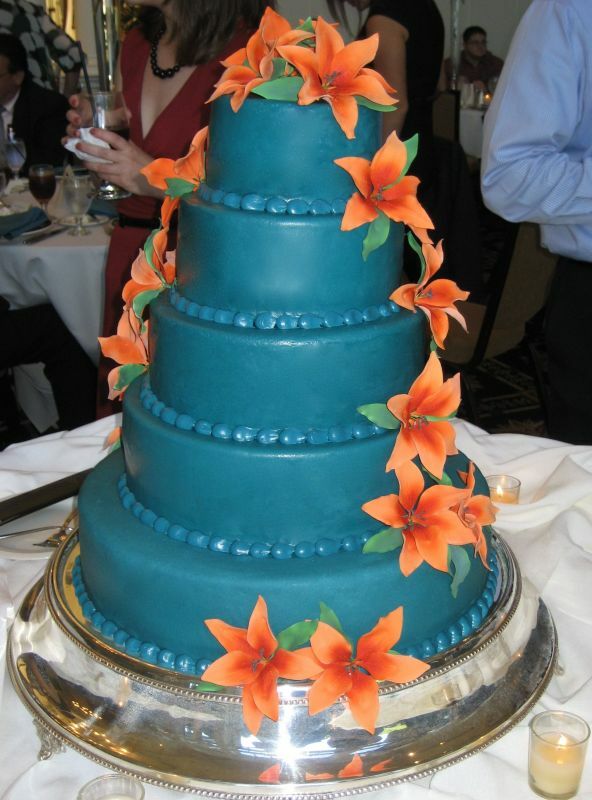 I’m having an orange and blue wedding and i cant find orange lilies for my cake anywhere. where did you get yours? Hi Mary! Thanks for reading! This cake was actually made a user, SarahSparkler, on Cake Central. The flowers featured are actually made of gum paste, rather than being fresh. Talk to your baker; odds are good that he or she can use gumpaste flowers, and tint them any color you would like! Also, check out the craft section of large hobby stores, like Joann’s or Michaels. They might have premade gumpaste flowers that you could tint, or you could go with a silk option. Good luck!